Roscommon CBS's James Fitzpatrick with Owen Fitzgerald of Scoil Phobail Sliabh Luachra, Rathmore. ©INPHO/Oisin Keniry. 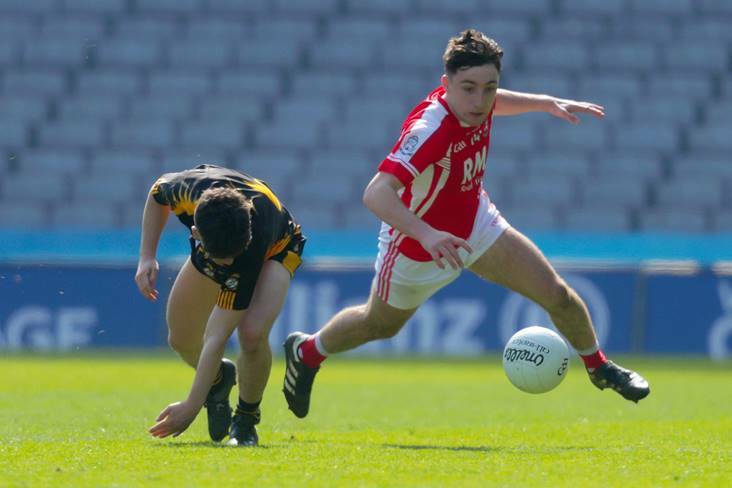 A long-range James Fitzpatrick point decided today’s All-Ireland Post Primary Schools SF ‘B’ final in favour of Roscommon CBS at Croke Park. The full-forward scored a point with the last kick of the game to leave the scoreboard reading Roscommon CBS 1-12, Scoil Phobail Sliabh Luachra 1-11 at the end of an absorbing encounter. The Connacht champions made the most of wind advantage in the second-half to overturn a 0-3 to 0-6 half-time deficit against their Kerry opponents. Roscommon CBS captain Ciaran Lawless lifts the trophy. ©INPHO/Oisin Keniry. 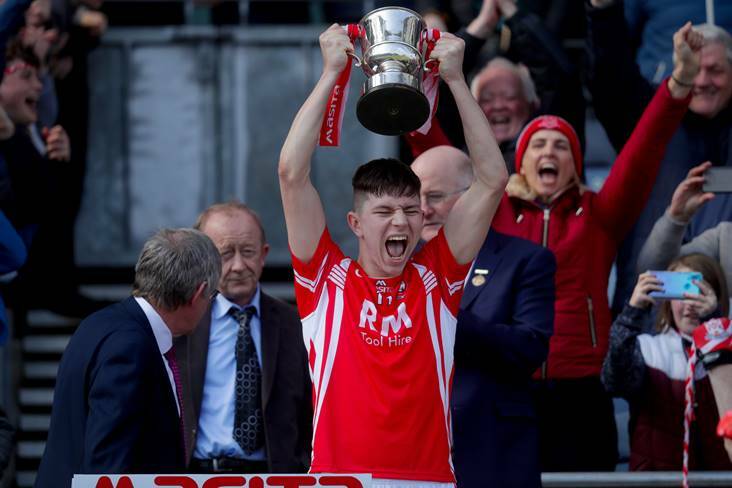 Half-back Cian Murray’s 42nd minute goal was a key moment in their second outright success in the competition but the sides were deadlocked after Roscommon CBS captain Ciaran Lawless and David Dineen exchanged scores. Fitzpatrick emerged as his team's hero when sending over the match-winning score from the edge of the D in the 8th minute of injury-time. The defeat was hard luck on Dineen who finished with seven points to his name while substitute Aaron Cronin netted the Rathmore school’s goal in the 54th minute. Roscommon CBS - G Rodrigues; J Browne, C Walsh, J Martin; C Glennon, J Lohan, C Murray (1-2); A Looby (0-1), K Doyle (0-1); T Lambe, C Lawless (0-2, 1f), R Walsh; L Ormsby (0-4, 1f), J Fitzpatrick (0-2), J McGahon. Subs: C Carthy for R Walsh, O Walsh for J Lohan.